This is part 2 of the World Cruise 2013 report, covering from Pitcairn Island through French Polynesia, and across the International Date Line. 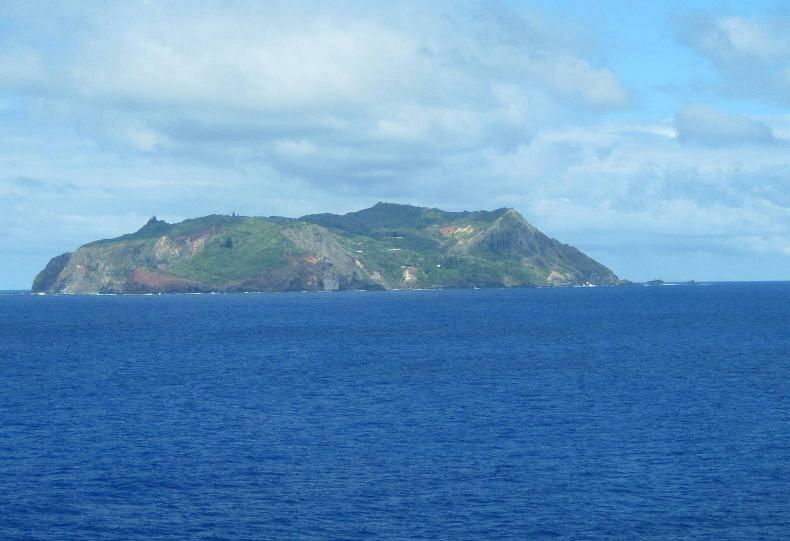 As we continued west across the Pacific towards French Polynesia (the many days at sea and its emptiness reminded the travelers that the Pacific Ocean by itself covers about 1/3 of the surface area of the entire planet) we paused to circle Pitcairn Island. You could almost say it's deserted, as only about 50 people live there -- almost all descendents of the mutineers from the British ship Bounty and their Tahitian girl friends. 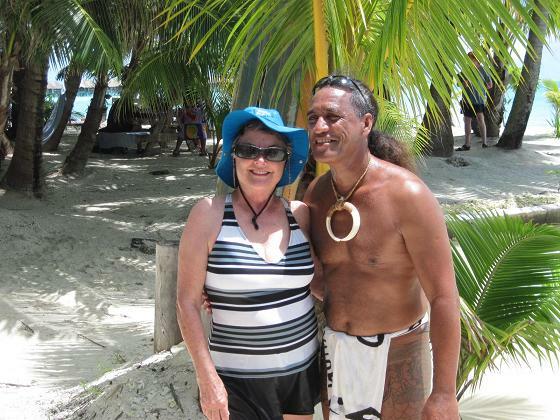 We were to visit 4 islands in the South Pacific -- Tahiti, Moorea, Bora Bora, and Rarotonga. 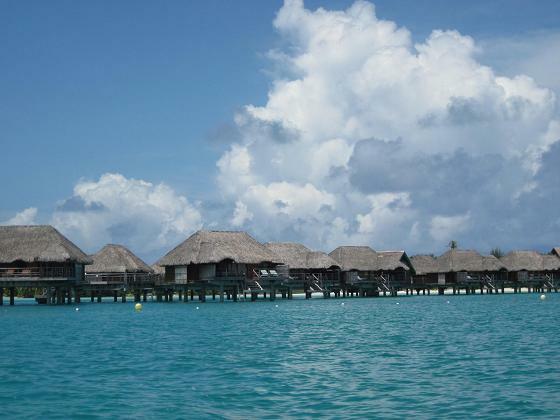 Our first call was Papeete, the French Polynesian capital. Tahiti still has some beautiful beaches, but has become very commercial and somewhat run-down -- and sort of like Honolulu of old since it has the biggest area airport, you practically have to go through there just to reach other nearby places. Compounding matters, it was Sunday, and almost everything in Papeete was shut down -- Mike and Sandy did find a little Internet cafe that was open, however. But what ever negative vibes one might have about French Polynesia were quickly dispelled the next day when the ship reaches Moorea. 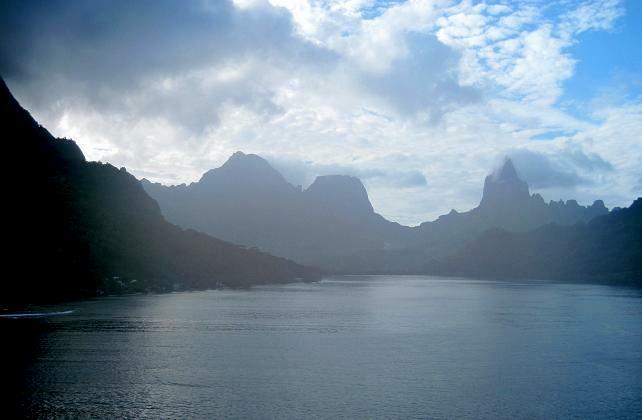 (The view sailing into the Moorea lagoon is the one featured in the movies as the mystical Bali Hai.) 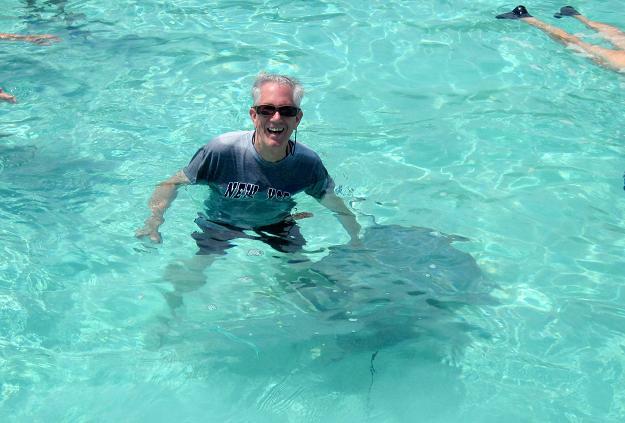 Here Mike and Sandy spent a day on one of the small islands along the circling reef, petting sting rays, admiring the sharks that come to get a snack, and exchanging stares with the tropical fish through our snorkel masks. The following day we visited Bora Bora, which although similar in appearance, is a bigger island, with a much larger lagoon (and many more up-scale resorts). Here Mike and Sandy's day in and around the water was in the hands of Patrick, a some-what famous (amoung female tourists, anyway) native man whose loincloth-draped body is covered with tatoos. Another great day in a beautiful place. 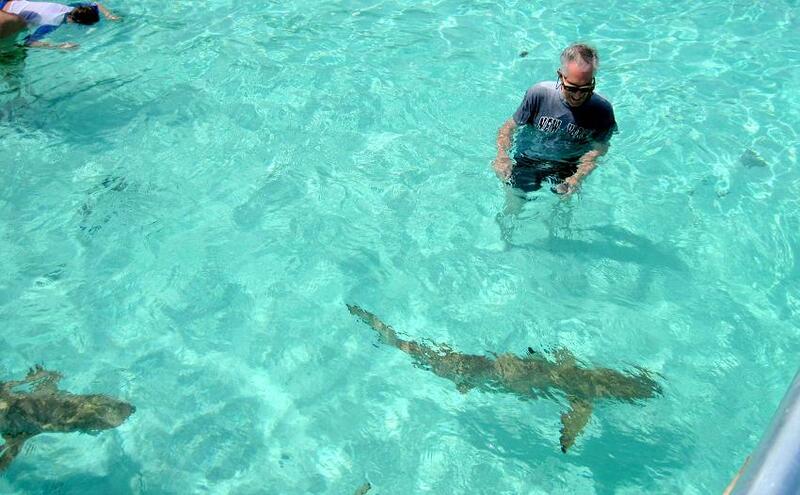 The last little island where we had planned to stop was Rarotonga, in the Cook Islands group. Unfortunately for the local merchants and tour operators, the winds and high seas didn't cooperate, and the captain decided at the last minute that it wouldn't be safe to launch our little tenders. (There's no harbor, and no pier anywhere near big enough for us.) So we waved, and continued our route westward, now planning to arrive in Auckland, New Zealand, earlier than our original schedule. The next "point of interest" was our crossing of the International Date Line. We went to bed on February 1st, but woke up the next morning on February 3rd. Newcomers to cruising this part of the world were supposedly told to be up and out on deck to watch for the dotted line painted on the water, but we couldn't confirm that! 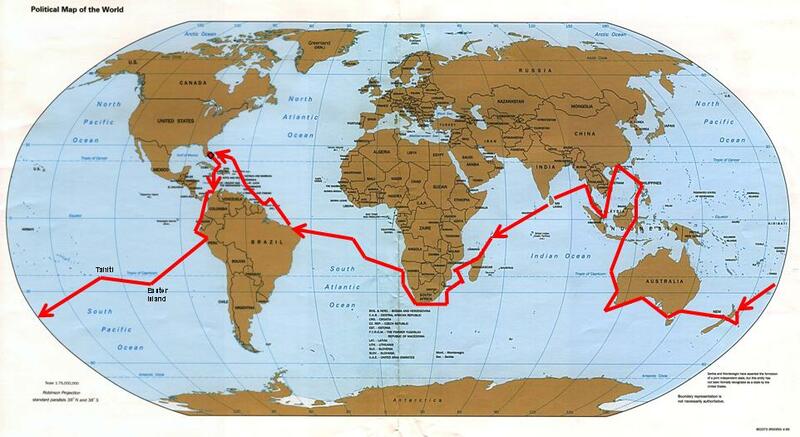 Next up -- a couple more days at sea, and then 5 New Zealand ports in a row.